From now until the Massachusetts high school football season begins on September 9th, I'll be no the road checking out some of the most promising teams in Central Mass. We begin today with the Shepherd Hill Rams, a team that enters 2016 with lofty expectations after an eventful 2015. The Rams didn't qualify for the postseason last year, thanks to a slow start against a brutal early slate, but rebounded to play some of their best football late, and built the foundation for this year behind a newly expanded offense and defense. Add in the fact that Shepherd Hill received a transfer from All-State running back Kevin Mensah, to go with its already loaded offense, and hopes couldn't be much higher in Dudley. All this couldn't have come together at a better time for Shepherd Hill, as realignment has placed the Rams in the new Division 2 Central, which also happens to be the largest classification in Central Mass. How will the Rams stack up against regional powers like Leominster and St. John's? Here's our camp report. One thing is readily apparent when you watch Shepherd Hill practice: They have no shortage of guys who can run the ball. Yes, Mensah was a huge addition, but this team would have been scary on the ground either way, with Zack Magdis, a 230 lb junior who runs the 40 in the 4.6 range, and classmate Brendan McKeon, one of the most versatile backs in the region. Mensah, Magdis and McKeon are all receiving Division 1 college interest, and it's apparent why. Along with a few others, they'll hold down the wing positions in Shepherd Hill's Double Wing. Combined with the athleticism of senior quarterback Ryan Wong-Li, and the physicality of the offensive line (more on that later), it's hard to see anybody slowing down, much less stopping Shepherd Hill's ground attack this season. True, the Rams and their Double Wing attack have become feared for their ground game, but expect Shepherd Hill to throw it a little more this year. Wong-Li has a year of experience under his belt and, with his mobility and arm strength, the Rams should be able to stretch opponents vertically and horizontally in the passing game. Wong-Li looked really sharp throwing the ball when I was there yesterday, and it's clear the coaching staff and players have a ton of faith in him heading into the year. "We've got Wong-Li back, and he can throw it like 60 yards," Brendan McKeon said. "We've got some good hands too with Kevin, me and Zack. We've got good hands all around." They'll need to replace tight end Sean McKeon (Brendon's older brother) who is now catching balls at University of Michigan, but Brendan made some nice grabs in practice, as did Mensah and senior tight end Jack Hetherman. The Rams were disappointed not to make the playoffs last season, after a slow start put them behind the 8-ball. But, some positives did come out of it, as Associate Head Coach and Offensive Coordinator Ryan Dugan opened up the playbook, letting Wong-Li throw it a little bit more. As a result, the Rams laid the foundation to have their most diverse offense in years. "We have a really great veteran quarterback in Ryan, and a bunch of backs who have been in the system for a while," Dugan said. "Last year when we were eliminated from playoff contention and we played in the non-playoff, we really experimented in the passing game. We had several games with over 100 yards passing and multiple passing touchdowns. I think it gave Ryan some great experience and gave our skill guys some great experience... We've got a lot of guys who can catch it and who can run it. Now it's my job to figure it all out and make it work." By now, everybody knows about senior Alec Lindstrom, who has committed to Boston College, where he'll join his older brother Chris, who started as a freshman for the Eagles last year. For those not familiar, the Lindstrom brothers are the sons of Shepherd Hill coach Chris Lindstrom Sr., a former NFL lineman who annually molds the Rams into one of the toughest teams in the state. So yeah, Alec Lindstrom is really good, like his brother and father before him, and much of what Shepherd Hill does up front begins with him at left guard. Known for his athleticism, Lindstrom is one of the best pulling guards in the region, but after a hard summer in the weight room, the senior is up to 240 lbs and ready to become a mauler as well. But don't sleep on the rest of this line. Left tackle Kam Murphy returns after starting as a sophomore. The junior may only be 5-foot-11, but he packs a whallop behind his 240 lbs, and senior tackle Matteo Belsito returns for another year of making room for backs off the right side. Senior Bailey Springer returns at right guard, and junior Dominic Battista is looking to make the transition from starting JV center to the middle of the varsity line. With a combination of strength, athleticism, experience and their trademark toughness, expect the Rams to boast one of the best lines in the state. 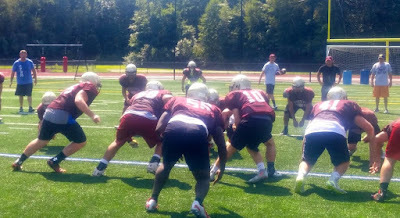 Much will be made of the Shepherd Hill offense, but the guys at camp seem to think the defense will be just as good. Led up front by Lindstrom at defensive end, and big O'Londo Loggins and Belsito at tackle, the Rams' will be tough to run on in their 4-3. At the next level, Hetherman returns as a play-making outside linebacker, and Springer will once again oversee things as the starting middle linebacker. The secondary is also stacked with speed and talent. Magdis and McKeon return at both safety spots, while corners Jake Zablocki and Jake Wagner seem poised to be one of the better duos in Central Mass. Wagner, who hopes to play at WPI next season, thinks this secondary can surprise people. "(The other defensive backs) are all just really smart football players, and we've got a lot of speed," Wagner said. "People are gonna have a hard time keeping up with us." Ed. Note- I originally mixed up where the Shepherd Hill-Leominster game was being played. I've corrected it to indicate that the Rams will visit Leominster the second week of October. The Rams come into 2016 with plenty of hype, ranked No. 15 in ESPN Boston's preseason Top-25, and with the addition of an All-State running back to an already loaded backfield. Lindstrom and company should make the Rams tough in both trenches, and a speedy back seven on defense should help them hold up against the diverse and spread out offenses they're likely to see against new divisional rivals St. John's (Shrewsbury) and Leominster. I should also mention that senior kicker Jake Tondel appeared to have a pretty strong leg, and was nailing kicks during drills. That is, whenever the snap and hold were right, which is always an adventure during the first full week of any high school camp. Thanks to that new division, there are no easy games for the Rams, who open up at home against Shrewsbury, then welcome St. John's a week later. A trip to Wachusett follows before the Rams return home to host Algonquin, a team that defeated them in a classic during the non-playoff schedule late last year. October begins with a trio of road games, first at Westboro, then at powerful Leominster, and finally at reigning Division 2 state champion Nashoba. The Rams then close out their regular season at home against Fitchburg, and travel to Tantasqua for Thanksgiving. Again, no easy games, but you have to like the fact that Shepherd Hill gets Shrewsbury, St. John's and Algonquin all at home. A trip to Bolton to face Nashoba is never easy, but the Chieftains lose a ton of experience from last year's state championship team. An early season road game at Wachusett could be trickier than people think, and traveling to face the Blue Devils at Doyle is always a tall order, but the Rams seem equipped to play with anybody in D2 Central. For his part, coach Chris Lindstrom is taking it one game at a time, and focused solely on opening night against Shrewsbury. "We play one game at a time. We feel like we have 11 bowl games," Lindstrom said. "That's what we're doing. We've got one game, and Shrewsbury is the biggest game of the year right now. That's all we're focused on." The Rams open the season at home against Shrewsbury on Friday, September 9th at 7 pm.